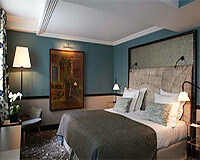 Hotel Thérèse is a charming 4-star hotel ideally located in the heart of Paris' enchanting Right Bank, near a number of world-renowned attractions such as The Louvre, The Palais Royal, The rue St Honore, and The Opera. Suitable for business and leisure guests alike, guestrooms of this retro-chic hotel of charm enjoy a variety of elegant decors, each of which boasts picturesque views and comes well equipped with a number of amenities including flat-screen LCD cable TV, mini-bar, safe, and complimentary high speed Wi-Fi access. In addition, there are a number of on-site features including convenient transport services, a tasty continental breakfast buffet of which can be enjoyed in an impressive vaulted breakfast room, or in the comfort of the guest's room, and outstanding concierge services ensuring that all guests of Hotel Thérèse enjoy an unforgettable stay in the beautiful French capital.